Tom Jefferson is a Sydney based photographer and cinematographer who works in documentary and drama. Tom’s stills work is often seen in the printed and online press and exhibited in Australia and internationally. His motion picture work including that for non-government organisations (NGOs) such as Greenpeace has been shown all over the world. Tom holds a Masters Degree in Documentary Photography from the University of Sydney. His website. 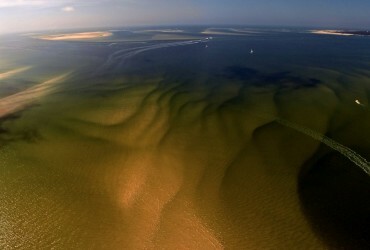 The entrance passes to the Arcachon Bay have the reputation to be treacherous. The dangerous sandbanks shift with every storm and strong tide. OCEAN71 Magazine proposes a unique navigational experience: a series of virtual visits with a 360° view from above, allowing the subscriber to visualize some of the many low tide traps.